her home is an oasis against dark thoughts and deeds. and a sunset to catch one’s breath about to make itself known. 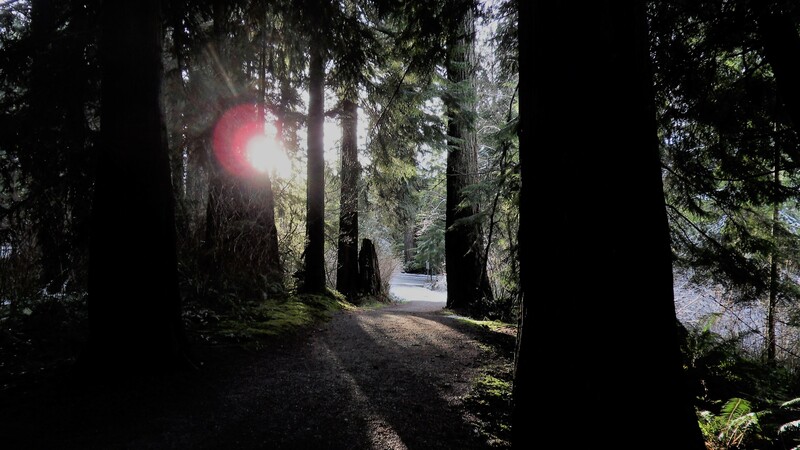 Capturing the sun on a wintry trail in the forest of Stanley Park (Vancouver, B.C.). This entry was posted in poetry and tagged apocalypse, change, forest, friendship, life, lucid dreaming, nature, New Year, path, poetry, reality, snow, time. Bookmark the permalink. It came to me while I was on my way to have dinner with Yvonne, it’s a wee bit dark but I couldn’t shake it – thanks for loving it, it means a lot! I’m so glad you enjoyed the read, Huguette – I am always happy to see your comments and read your notes! Kimberlee, you hit it out of the ballpark again. Your gift for prose really helps to paint a vivid picture in my mind’s eye. Thanks for sharing. Thank you again for your very encouraging words, they are manna for a writer’s soul and I’m so very glad you enjoyed this piece! This is a beautiful written piece, I love how you paint the image for your readers. Not everyone can write a prose without leading me to boredom, but you wrote it so well that I was intrigued to know more and continue reading till the end. Wow, I’m so touched by your wonderful comments and so glad you enjoyed this piece, it means a lot! It’s my pleasure, keep writing and allowing us to enjoy your writings. Hi, nice to meeting you from Nikki’s party. My sister lived in Vancouver, BC for years and I went to visit them a couple time. Hi I’m Miriam, just want to say ‘hi’ and follow, will be back to visit more. Thank you so much, Miriam! So glad you dropped by and I will do the same – I really enjoy meeting new bloggers at the Meet & Greet parties so generously hosted by such lovely bloggers! Take care! You’re welcome. The nice thing is that bloggers who go are ready to connect. I tried other ways, but didn’t get good responses. Hope to see more of you. Your posts now will come to my reader! So I’m see you. Such a lovely poem. Apparently, you would be one of those very rare people whose eyes are lost in the anticipation of a dinner meeting with a friend and not locked onto a screen. Sometimes, I wonder if technology has limited man’s imagination to gaming, apps and other electronic devices. Hope you had a wonderful dinner with your friend! Thank you so much – I feel so blessed to read comments like yours, it makes the joy of writing all the sweeter! Dinner at my friend’s apartment is always peaceful and her meals are delicious, thank you for asking!! What a perfect gem you are! Here I am in the middle of writing down some thoughts for my next post and your encouraging words are “lifting me higher”…thank you as ever! I really enjoyed this beautifully written work, Kim. I can feel the world dissolve into the soul of the poet. You’ve touched my heart, thank you for stopping by and leaving such lovely words!